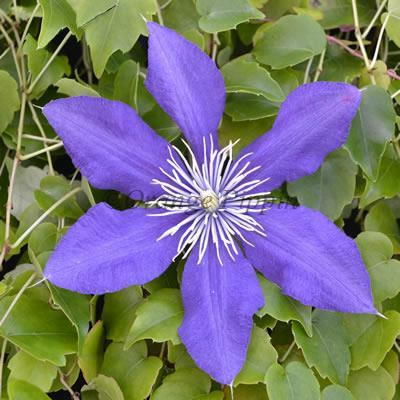 Clematis 'North Star' is a sturdy variety with violet-blue flowers complimented by a reddish-purple stripe/shading making them particularly attractive from June to September. It is not often that a coal miner plants a Clematis garden, but that is exactly what Frank Watkinson did during his retirement from the mines at Askern on the Yorkshire coal field of Selby. He literally planted out a row of Clematis and gave them pea-sticks on which they prospered. He was enterprising and to his delight, a number of seedlings he raised were quite distinctive and among them 'North Star' is outstanding.